I'm still knitting away at my Camp Loopy project. I'm partway down the first sleeve now. 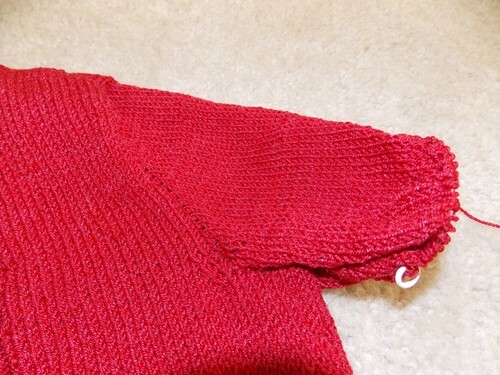 I love the concept of knit in, top down sleeves (no sewing in later), but I really hate working the short rows. Towards the end of the short rows, right before you start going around and around on the sleeve, it gets really tight on the needles and I just hate the way it feels. Then I'm on to the round and round part and it goes faster and easier again, but I really dread the last bit of the sleeve cap short rows. Does anyone else feel this way? Are there any tricks to this? I've tried working with two needles, should I add a third? Should I do it with DPN's? I've never liked this one part of this technique (it's not just this pattern, it's the top down knit in sleeve technique in general) and honestly, I'm already dreading the second sleeve. Any ideas? Otherwise, this project is going just fine. Max thanks you all for your Happy Birthday wishes (or he would if there weren't 7,000 birds outside right now). I dread doing sleeves also, but have found that using the magic loop method does make things a little easier. I use two circular needles, which work well. They're also great for socks. DPN's work best for me in tight situations - allows for more areas to "bend" so you don't feel like it's so tight, and it doesn't pull on as many stitches. DPNS. That way you can really control the gauge.